When out in the wilderness, you need to be ready for any type of situation. After all, you will generally be out in the middle of nowhere. That’s why hunters normally bring medical supplies and first aid kits with them. Unfortunately, they tend to forget about their hunting dogs in that respect. Hunting dogs can get hurt, too, and they need just as many medical supplies as you. Because of this, you should stock up on some dog health supplies for your next hunting trip. Hunting dog medical supplies are a bit different than humans’ first aid kits. Dogs rarely benefit from emergency aspirin or from adhesive bandages. Instead, most of what’s in a hunting dog medical kit is for serious injuries only. After all, most dogs are tough enough to handle minor injuries. One of the first medical supplies you should get is gauze. There are occasions where a dog might get a flesh wound. This can happen if they get in a fight with another animal, or if they get caught in some brambles. You should carry gauze with you just in case this happens. When the dog gets hurt, clean the wound with some water and wrap it with gauze. They should be fine until the end of your hunting trip. Another entry into your hunting dog health supplies kit is a splint. Dogs are used to running around in tough conditions without thinking about their safety. This can cause some dogs to fall off high places. If this happens, they may end up breaking a leg. This happens more often than you would expect. In a case like this, you should splint up your dog’s leg with gauze and splint to keep in safe until you leave. If something like this happens, you should probably leave immediately. Broken bones are serious business and the leg should be looked at by a veterinarian. Because of the importance of this kind of injury, a splint is one of the must have medical supplies for dogs that you should carry with you when you go on your hunting trip. There are other, less important items that should be in the dog health kit. Most large pet stores carry a small kit that you can bring with you while you’re in the wilderness. 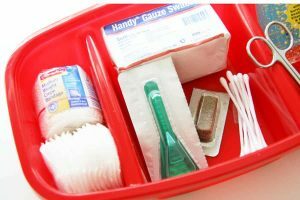 It will have all the small items that you’ll need, including tweezers and antiseptic ointment. Be sure to carry all these hunting dog medical supplies with you during your hunt just in case of any emergency.